Sherlock: Well, I’m certainly not cleaning that up. It was in honor of me after all. A bit bleary-eyed after the Sherlock Holmes Appreciation Assembly, but surprisingly upright (it was at the library so no alcohol). I’m not certain that will be the case if the BBC Sherlock Marathon I was conned into offering actually happens within the next 3 weeks. Someone already mentioned everyone bringing wine. Becky Maltbie and Cora Pond (no relation to Amelia apparently) for helping to tear down and load the Prius (why yes, it does get great gas mileage but it also does a smashing impersonation of a station wagon). I actually made it to bed before 10 p.m.
Linty Hopie for the loan of the air pot (I’m having the last of the coffee as I type and it’s still hot!). Mary Brelsford for the loan of several thermoses and for coming in the afternoon and joining The Great Game discussion. I’d also like to thank the folks who offered prizes (even though we didn’t get to give all of them away, alas. We’ll start sooner next year and give folks more time for costuming, cosplay and artwork entries. Our video winner was Heidi Berthiuame of Plano, TX. Jeremy Brett was the winner of Best Sherlock in the traditional category. Basil Rathbone was a close second. Benedict Cumberbatch was the hands-down winner in the alternate universe category. Anyway, I’ve got a lot of things to put away and return today. And then I have to turn to class prep for next week. Happy Sherlock Holmes Week and thank you to everyone for your support! 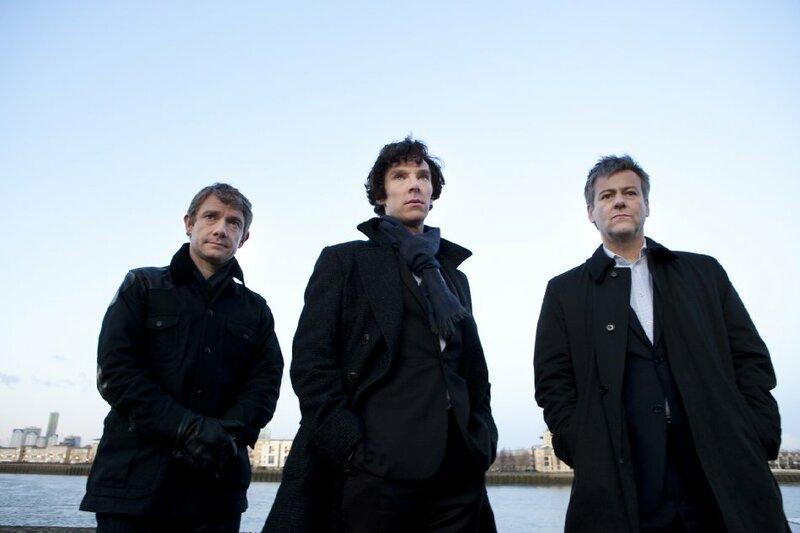 This entry was posted in Captions, Other and tagged bbc sherlock, benedict cumberbatch, fan video, FanFic, Fiction, greg lestrade, john watson, martin freeman, photo caption, rupert graves, Sherlock Holmes, Sherlock Holmes Week, tv series on August 2, 2012 by JH Watson.